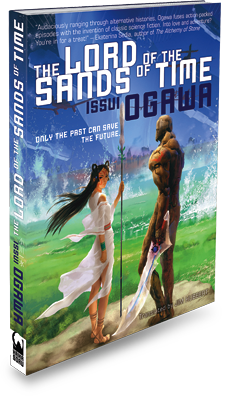 ﻿ THE LORD OF THE SANDS OF TIME « Haikasoru: Space Opera. Dark Fantasy. Hard Science. Sixty-two years after human life on Earth was annihilated by rampaging alien invaders, the enigmatic Messenger O is sent back in time with a mission to unite humanity of past eras--during the Second World War, in ancient Japan, and at the dawn of humanity--to defeat the invasion before it begins. However, in a future shredded by love and genocide, love waits for O. Will O save humanity only to doom himself? Issui Ogawa is known as one of Japan's premier sci-fi writers. His 1996 debut, First a Letter from Popular Palace, won the Shueisha JUMP Novel Grand Prix. The Next Continent (2003, Haikasoru 2010) garnered the 35th Seiun Prize. A collection of his short stories won the 2005 Best SF Poll, and The Drifting Man, included in that collection, was awarded the 37th Seiun Prize for domestic short stories. Other works include Land of Resurrection, and Free Lunch Era. Ogawa is a principal member of the Space Authors Club. A small, high-speed shuttle on the surface of the Moon. The Messengers had been traveling back and forth between Earth’s bases scattered throughout Sol System as far as Mars.